Years ago, before I had a juicing business, I was using my friends champion juicer. It was nearly new, maybe only 2 weeks old. One day, I was taking it out of the drying rack, and put it together to make carrot juice, washed all my carrots, and was ready to juice, flipped the switch on the champion, and.... nothing.. I was like, what the heck? I thought to myself, "geez, this thing is like brand new, and it stopped working? Is it defective? I thought that it couldn't be, since its made in America, and generally, I feel that items made in America are usually more reliable than items made in Asia.. I was stumped. At this point, since I'm pretty handy with fixing things, and that was my line of work at the time, I took the juicer apart to see what was going on. When I took it apart, I saw the power leads go to some sort of switch, more specifically a magnetic switch. Knowing this, I put the juicer back together, and assembled all the parts, and It still did not work. I then took a magnet and stuck it in front of the juicer housing where the switch was behind, and low and behold, the juicer came on. I later figured the magnet was located in the funnel or holder, and prevented the juicer from coming on without it in place. 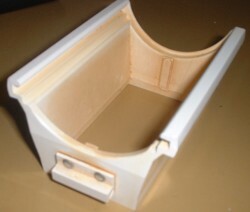 This was done as a safety feature, so that the juicer is properly assembled before it will work. Please see the picture to the right to see how you can test the juicer to see if there is a problem with the magnet in the funnel. 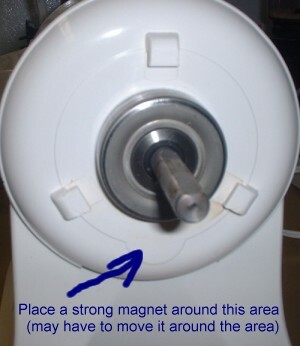 With the juice plugged in, place a strong magnet (not the FLAT ones) in the area shown. You may have to move the magnet around in the area. The motor shaft should start to spin, so stay clear of it. 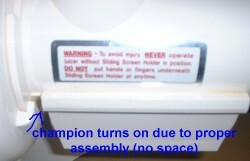 In this picture, the champion is not assembled correctly, so the juicer will not come on. 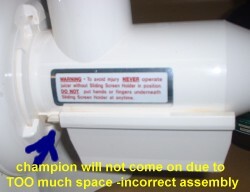 The champion is assembled correctly in this picture, so the motor turns on. This is the "funnel" or "holder" - It holds the screen in place. Please note the riveted plastic piece (looks like a square tube) at the front of the picture. It holds the magnet that activates the safety switch. 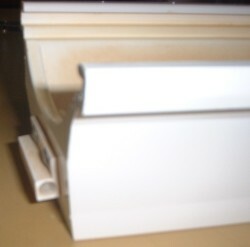 This is a side view of the "funnel" or "holder". Note the circle on the side of the square tube. Some glue holds in the cylindrical magnet. I have found that sometimes the glue (which acts as a plug) comes out, and the magnet is misplaced or lost. Luckily in my situation, I found the magnet, put it back into the juicer, and glued it in place with some hot glue.